In Northwest Florida, reports of fish kills were reported for areas in and/or offshore of Okaloosa, Walton, Bay, Gulf and Franklin counties. 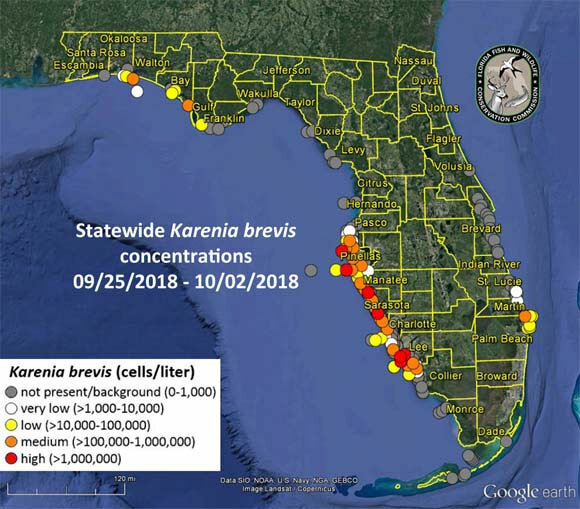 A bloom of the Florida red tide organism, Karenia brevis, has been observed in or offshore of Okaloosa, Walton, Bay, Gulf, and Pasco counties, with up to “medium” concentrations observed in Bay County and offshore of Walton County, according to a report by the Florida Fish and Wildlife Conservation Commission. In Southwest Florida, reports of fish kills were received for multiple locations in Pinellas, Manatee, Sarasota, Charlotte, Lee and Collier counties. Along the East Coast of Florida, reports of fish kills were received for St. Lucie and Palm Beach counties. Three-day forecasts for Northwest Florida predict minimal net transport of surface waters and northeastern movement of subsurface waters from Escambia to western Gulf counties. The next complete red tide status report will be Friday, October 5.